It is always best to install a liner when temperatures are above 65° with some sunshine. Liners should never be installed during temperatures below 50° and sunny. If you choose a pool liner that is thicker than standard (20 Mil is the standard thickness for in ground liners) then the need for warm weather is greater. In cold weather liners do not stretch into the corners, it is harder to keep them wrinkle free and in extreme cold the vinyl can even become brittle and crack. For this reason in New Jersey the months of December – February are not good times for liner replacements (with the exception of a few unseasonably warm day. Many People underestimate the importance of getting a liner replaced before there is an actual failure with complete water loss. 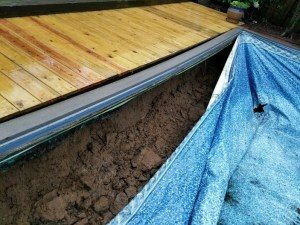 If a pool loses all the water quickly the base of the pool can be destroyed causing a bigger repair. If a liner has a failure and it goes unnoticed and the pool is left empty for an extended period of time the entire pool structure can be compromised resulting in thousands of dollars in extra repair costs. When you see your liner is getting older, before it gets brittle, is the best time to schedule your new liner replacement. The picture below shows an entire 16′ pool wall that collapsed due to a pool being left empty for a few months. If you want your pool open before your Memorial Day party, you are not alone. Every pool owner is trying to get their pool open in time for the big party, so if you need a new liner, make sure to plan ahead and get on a schedule before the big rush. We notice that in January we start to get phone calls from people starting to ask about pricing and planning for their pool opening. Scheduling your install early helps both you and your pool dealer to be able to work together to get your liner done before the spring rush begins.